Wealthy Utahns advocating for economic justice delivered a letter to Sen. Orrin Hatch’s downtown Salt Lake City office imploring him not to support tax cuts for people like them. 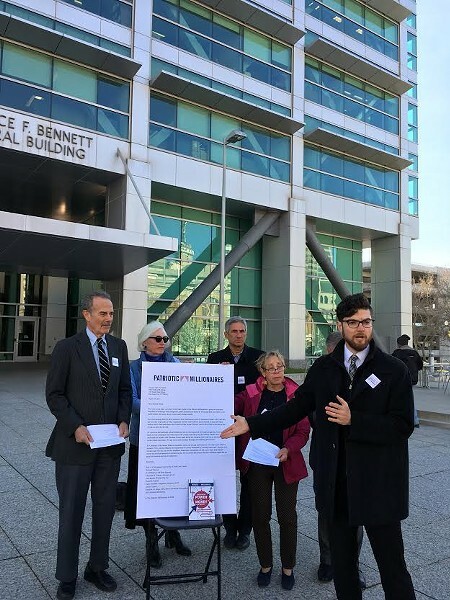 About six members of the Utah chapter of Patriotic Millionaires, which bills itself as a group of high-network Americans, met Wednesday morning outside the Wallace F. Bennett Federal Building, in which Hatch’s Utah office is located. They spoke with the press then headed upstairs to drop off their message. Members say President Donald Trump, during his candidacy, pledged not to lower taxes on the wealthiest Americans, and that the U.S. Secretary of the Treasury Steve Mnuchin has reiterated that sentiment. “Steve Mnuchin confirmed that promise that President Trump made during the campaign with a call for no absolute tax cuts on the richest Americans,” it states. A New York Times article from July, however, notes that while Trump differed from his Republican rivals on many issues, both sides were in agreement over a tax system that benefited the rich. And Mnuchin’s told Business Insider that under Trump’s budget any tax cuts to the wealthy would be offset with the closure of other tax loopholes. Jonathan Ruga, CEO of Sentry Financial Corporation, said he is hopeful that Hatch, Utah’s senior senator, will sincerely consider their message. “Senator Hatch is a very smart individual. I do think he will struggle with this idea but if enough people make it clear that this is what is best for the country and this is what the constituents want, then as our senator he will at least listen and hopefully consider what we are proposing,” Ruga said. Heather Barney, communication director for Hatch, said her office received the letter and they will forward it to the senator in Washington, D.C., but she could not speculate whether it was something Hatch supported. “He will be aware of the request,” she said. More than acknowledge the request, Ruga hopes Hatch will agree that wealthy Americans can afford to pay a larger share of their income for the betterment of the country. This demonstration in Salt Lake City comes at a time when talk of the federal budget takes over the nation’s capital. The Trump administration released a partially proposed budget that would gut the Environmental Protection Agency, the State Department, Labor Department, and others. The Departments of Defense, Veterans Affairs and Homeland Security would see a bump in funding.